Light reflected off Saturn allows the Cassini spacecraft to capture both the back-lit plume and the surface of Enceladus in one shot as seen in this amazing space wallpaper. 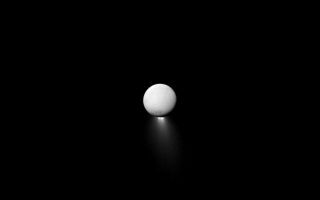 Enceladus's unusual plume is only easily visible when the Cassini spacecraft and the Sun are on opposite sides of Enceladus. So what's lighting up the moon then? It's light reflected off Saturn. This lighting trick allows the Cassini spacecraft to capture both the back-lit plume and the surface of Enceladus in one shot as seen in this amazing space wallpaper. This view looks toward the Saturn-facing hemisphere of Enceladus. North on Enceladus is up. The image was taken in blue light with the Cassini spacecraft narrow-angle camera on April 2, 2013. The view was acquired at a distance of approximately 517,000 miles (832,000 kilometers) from Enceladus and at a Sun-Enceladus-spacecraft, or phase, angle of 175 degrees. This image was released Sept. 23, 2013.